There are foods that have been used for thousands of years because of their nutrients, flavor and or ease to harvest, finding in nature a lot of alternatives to heal us and stay healthy. Thanks to the current globalized world; we have an easier access to a lot of them, but also these markets and its propaganda share the benefits found in a lot of natural foods. Sometimes they’re wrong, sometimes exaggerated, and once in a while, that info can be a whole fake or manipulation of the real truth. We explain all of this because flax seeds have been important nourishment since agricultural life appeared. Its first uses in foods are dated back to 10000 years. They provide us with several nutrients that we’re going to list next, but they also have some disadvantages for our health if we eat a lot of them, or use it to substitute other important meals, which is a habit found in a lot of people (like vegetarians) that, as we’ll explain, is sustained on manipulated or misunderstood information. So, welcome to our post about the 7 best benefits from flax seeds and the limits or considerations we need to take care of its consumption. One of the main distinctions of flax seeds is the high amount of lignans, which are antioxidants that promote anti-aging and with a moderate consumption, help your body to keep a hormonal balance. A significant amount of lignans can be obtained from up to 4 tablespoons of flaxseeds. Another most important benefit from flax seeds is that you can get anti-inflammatory effects from them, thanks to Omega-3 fatty acids found in them. With a balanced diet, they can reduce formation of cholesterol deposits and inflammation in blood vessels. 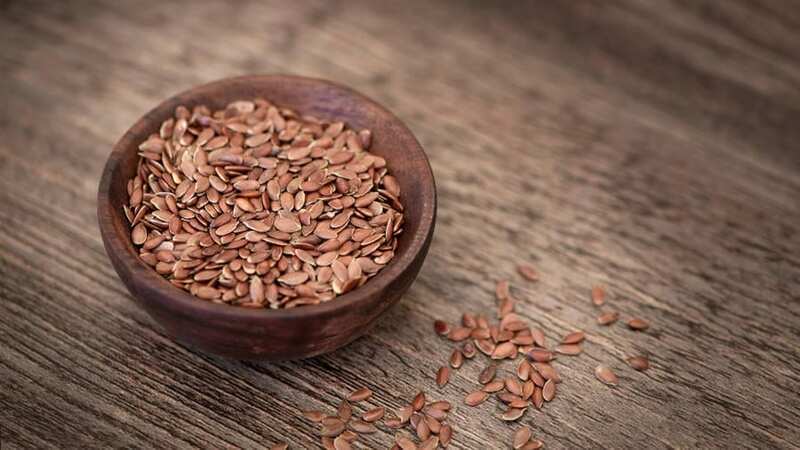 Because of the hormone-balance effects we mentioned, flax seeds consumption can be a natural way to help prevention of hormone-related tumors, which are protagonist in most of the cases of breast, uterine, prostate and ovarian cancer. Anti-inflammatory properties of this food lower risks of this and other types of cancer, which are caused by chronic inflammation. If there’s a problem related to constipation or inflammation in your intestines, especially in your large intestine, eating flaxseeds may be a secondary solution for this problem. We say ‘secondary’, because to reduce and eliminate constipation, irritable bowel syndrome or intestinal intoxication requires a lot of changes in nourishment and lifestyle, in which flax seeds occupy a small role in comparison. Nevertheless, it’s an alternative to consider for prevention against many of those problems. One of the most famous reasons why people are using this food is due to its efficiency to help reduce weight, as it helps intestinal cleansing and balance; and sometimes that’s what body needs: a boost to release all toxins inside. This effect can be achieved faster and in an easier way by doing workout and drinking plenty of water every day, eating meals with organic ingredients only and reducing refined sugar, beef and other mammals’ meats as much as you can. With a regular consumption of flaxseeds in a balanced diet, your look will keep its radiance and beauty, because of the antioxidant effects of this gift of nature. If you use them as an isolated solution or as a prevention resource of aging without a healthy lifestyle, you may not see its benefits soon, as the skin is one of the first victims of metabolic disorders, as well as of chronic stress and lack of nutrients, due to chronic inflammation caused by lifestyle and stocked emotional conflicts. As they are an important source of fatty acids and minerals, the oil from these seeds is very useful to take care of your hair, in case of dryness, dandruff, slow growth and hair loss. It’s a wonderful option for those people that have passed through chemotherapy protocols and lost their hair. In contrast to what most of the people may think, any kind of seed can turn into a potential allergenic or menace for our immune system. It’s because plants don’t drop their seeds defenseless. There are always chemical defenses included in their ‘babies’ so that if a predator eats a lot of them, its organism will get damaged and thereafter, will ‘learn’ to evade as possible massive consumption of those seeds. Even plants that give fruit produce that fruit, not as an easy gift for everyone, but to use us and other animals to disseminate their seeds, by throwing or evacuating them. In case of humans, this problem may appear in such a way that some people become allergic to flax seeds or develop hormonal imbalances in a long-term, as phytoestrogens in these and another seeds and legumes eaten in big quantities, won’t regulate but increase hormonal problems, especially those related to high estrogen levels. Eating too many flax seeds may also provoke chronic problems related to stool consistence or even diarrhea, as what we need for an optimal health is integral physical activity, emotional wellness and a balanced diet instead of huge amounts of fiber. This is why here in Meditative Mind we promote balance for your life, as human being’s health is multidimensional: physical, mental and spiritual, and nourishment habits are a reflection of balance in our lives and what our soul will attract.